It’s interesting, isn’t it, how much the late Beatle and peace activist John Lennon has become an international symbol of peace. 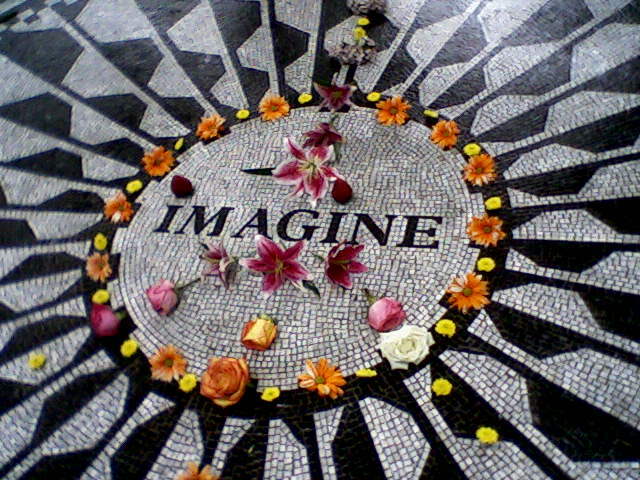 Near Central Park West, between 71st and 74th Streets, is Strawberry Fields, 2.5 acres in Central Park that pays tribute to Lennon. John Lennon and his wife Yoko Ono lived in the Dakota Apartments across the street, and it was here, on December 8, 1980, that John Lennon was murdered. Named after the title of the Beatles’ song “Strawberry Fields Forever,” it was dedicated as a garden of peace in 1985. Central to the area is the iconic black and white mosaic, named after another famous song by John Lennon, “Imagine.” It evokes a vision and hope for a world without strife, war and conflict. It has become a place of homage on the date of his death and the date of his birth, October 9th.